The positive sentiments on the floor of the Nigerian Stock Exchange (NSE) continued Wednesday as the equities market extended its bullish run in six consecutive trading sessions. The bourse benchmark index grew 0.8% to settle at 29,498.31 points, while year-to-date (YTD) gains improved to 9.8%. Wednesday’s performance was buoyed by upticks in DANGCEM (+4.7%) and NIGERIAN BREWERIES (+2.4%), which offset profit taking in GUARANTY (-5.0%) and SEPLAT (-5.0%). 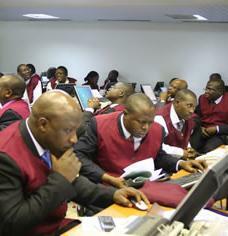 Accordingly, investors accumulated N76.6bn as market capitalisation increased to N10.2tn. However, Market activity, waned as volume and value traded declined 58.8% and 56.0% to 343.2 million units and N3.3 billion respectively. However, performance across sectors was mixed as three of five indices appreciated: The Insurance index led sector gainers, up 2.5% on account of appreciations in MANSARD (+8.2%) and CUSTODYINS (+5.3%). Likewise, the Industrial and Consumer Goods indices rose 1.9% and 1.5% respectively on the back of gains in DANGCEM (+4.7%) and NIGERIAN BREWERIES (+2.4%). On the flip side, the Banking index dipped 3.1% due to profit taking in GUARANTY (-1.5%) and ZENITH (-2.8%), while depreciations in SEPLAT (-5.0%) and OANDO (-5.0%) dragged the Oil & Gas index 2.3% southwards. Investor sentiment, as reflected by market breadth (advancers/decliners ratio) remained positive, closing at 1.7x consequent on 31 advancers against 18 decliners. The top gainers were UAC-PROP (+9.8%), MANSARD (+8.2%) and LAWUNION (+7.7%) while the top losers were GUARANTY (-5.0%), NEM (-5.0%) and SEPLAT (-5.0%). Following the six consecutive days of appreciation, analysts at Afrinvest expect investors to start taking profit in the trading session ahead. This is further buttressed by the fact that market 14-Day relative strength index (RSI) currently stands at 81.9 points (overbought region) and historical trend shows that market performance usually turns once the RSI crosses the 80.0 point benchmark.